Your bench and fly box look like they are right of that magazine you mentioned. Especially compared to mine. My bench is 4 feet from where I'm sitting right now and I'd get lost finding it. 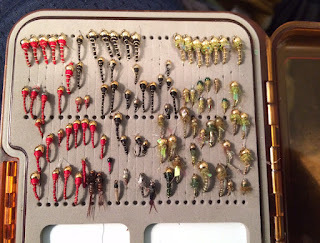 When I look for my favorite fly I always start out looking at the back of the back seat of my Mariner. It's usually stuck there because I forgot to put it away.